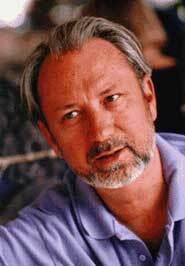 Michael Nesmith was the guitarist in the first manufactured band, The Monkees. TV executives picked the bandmates from thousands of applicants, and Nesmith and Peter Tork were the only two who actually played their own instruments, at least at first. But even they did not play much on the band's first two albums, as studio musicians played most of the songs. The Monkees were criticized as "the pre-fab four", and it especially grated on Nesmith's nerves. He thought of himself as a musician, and went public with the widely-suspected fact that their music was not theirs. "The music on our records has nothing to do with us", Nesmith told TV Guide at the height of Monkeemania. "It's totally dishonest. We don't record our own music. Tell the world we're synthetic because, dammit, we are! We want to play on our own." When the TV show made the Monkees famous enough to exercise their clout, they were allowed to write and record their own music. When they got fairly competent, Nesmith invited media critics to visit later Monkees recording sessions, to prove that they were an actual band. Nesmith wrote the Monkees' "She", "Mary, Mary", and Linda Ronstadt's "Different Drum". Nesmith left the Monkees in 1970, and performed country rock for years. His Elephant Parts was the first video to win a Grammy, and Nesmith's company became a pioneer in selling home videos of TV shows, including Ken Burns' The Civil War. That business ended in a messy lawsuit, with Nesmith and PBS fighting in court, and Nesmith won $46 million. Nesmith later produced Tapeheads, an enjoyable movie about videomakers and political scandal, starring John Cusack and Tim Robbins. Nesmith is sometimes called "the stepfather of MTV" because he produced a half-hour pilot for a music video show to be called PopClips. The series was never made, but Nesmith sold the rights to Time-Warner, which tweaked the idea and spawned MTV. When the original Monkees reunited for a tour in 1996, Nesmith performed with them only once. He thought the reunion tour would be boring, and besides, he was the only one of the four with prior commitments and an actual career. Nesmith's mother invented correction fluid -- Liquid Paper -- in 1956.